This is one dark abyss you shouldn’t fear. Well… you can fear the prep as your rip your tiny krakens apart, cutting off it eyes, and squeezing the innards from its delightful hood. Risotto is rich. So is this stuffing. This makes enough for 4 people. I highly suggest serving it with a salad just to bring the rich down a notch. The whole thing is very involved, there is multi tasking. It might be a two person job, but its well worth the work. To clean the squid, pull the heads the hoods, and set them aside. Remove the gladius (Pokey, semi hard thing sticking out, and squeeze out the innards. Remove the skin layer, thoroughly flush the inside, and stick them in a bowl of lemon juice and salt. Take the head, chop off the eyes, pull off its tiny beak and give it a little squeeze just to make sure you got everything. I told you, its ok to fear this part. I have a low threshold for gross, and this got me a little. Give the tentacles a rinse, and add them to your hoods for about 30 minutes if you have a few squids that are too small for stuffing slice them up. When they finish marinating, pat the tentacles and the hoods dry. Take the mushrooms, pancetta, garlic, shallots, and celery, and saute them in half the butter with a little salt until blanched. Remove it from the heat and let it cool. While its cooling, cook up 1/2 a cup of cornmeal. Bring 2 cups of salty water (add about a tsp of salt) to a boil and slowly whisk in the cornmeal until it thickens, remove it from the heat, stir in the mushroom mixture, and add in the crab meat, breading, and lemon juice. Once its cool enough to touch, stuff the mixture into the squid hoods. You can spoon it in (painfully messy), or take a pastry bag.. or a ziplock with a corner cut off, and squeeze it in. Secure the hoods shut with a toothpick. Dip each hood into a whisked egg, and dredge it in the flour. Set it on a floured plate while you cook the risotto. Heat up the chicken broth, and squeeze in the squid ink (try to get it all out of the packets). Leave that on low, so it stays warm and combines well with the ink. Saute the leak with the garlic, lemon zest, celery, saffron, salt and pepper in butter, until its blanched. (At this point heat up the oil for frying your squid) Add the rice to the onion mixture and let it simmer for just a little bit, before you add in the wine. Once the wine cooks into the rice, begin to ladle in the chicken broth, slowly stirring it in until it dissolves into the risotto. Continue to do this until you have about about 2 cups of broth left, and start frying your squid. I did mine only 2 at a time so I could multitask, You have to watch the squid, because if they get too well done, they pop, violently, and you don’t want that at all… mostly because its very scary. Once they are golden brown, place them on a paper towel, to absorb the excess oil. When you finish ladling in the broth and reducing the liquid, add in a pad of butter, and the cheese, and let it sit for five minutes while you saute the remaining tentacles in a little butter until they stiffen and begin to curl. (They have flavor from the lemon juice and salt you set them in don’t add more seasoning). 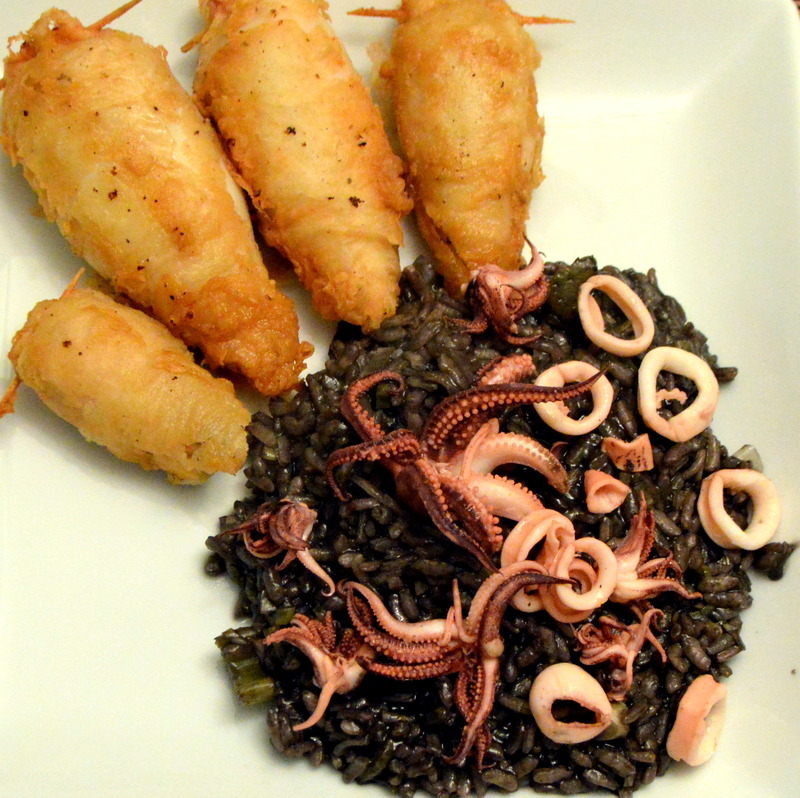 Sprinkle your little squid buddies on your risotto, and finally serve it all up. Gobble down that black richness till you’re out of breath. You deserve it. You defeated the kraken today. Sooo rich, sooo delicious.